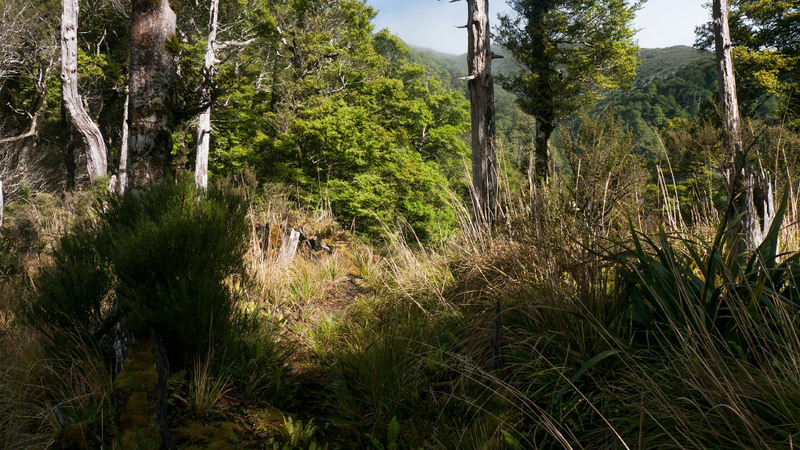 The track from Leon Kinvig hut in the Pohangina headwaters to Toka on the Ngamoko Range begins on the far side of the river and immediately climbs steeply until it briefly levels out, here. Then it starts climbing again. The photograph I posted a couple of weeks ago looks back down the track from this spot. Oh yes! I could do this bit! Thank you for a lovely start to the day when it's snowing outside. RR, snow would have been impossible to imagine when we were climbing this track. Now, after a sudden change in the weather, I can imagine it easily. Fortunately, the forecasters say summer's set to return soon. Once again you put me in a place of just sitting here staring at this lovely moment. Easier, I might add, from here, than there where even in the midst of such places in the Ruahine, though we admire and are even overwhelmed by the beauty and splendour around us, we know the climb has not even yet begun, and those far off tops seem a long ways off. Yet somehow, soon enough we are there. I guess I am slowly learning to appreciate the journey rather than the destination more and more. Kia ora for sucha thought provoking moment you have shared. Te hei Mauri Ora! By the way Pete. What is the condition of the track? It has been a few years since I have been up or down it, but the last time on my own it was overgrown and diabolical. Sorry about the late reply, Robb and Maureen. I've been without Internet and landline since last Thursday (still am — I'm at the City library now). Robb, the track's in good condition apart from a few small overgrown parts. As always, the part through the tupare's a bit closed in, but it's still easily traversable.